This cake was carved out of 2 red velvet sheet cakes stacked up and frosted with cream cheese frosting and covered with home made marshmallow fondant. The head is a giant rice krispy treat ball covered in buttercream and fondant. I placed several wooden dowels in the cake as well as 4 longer ones from the cake up into the head. The "plaque" is also made of fondant and it's trimmed with some dark chocolate. The eyes are also piped on dark chocolate. The back of the cake has the birthday boy's last name in layered fondant cut outs. 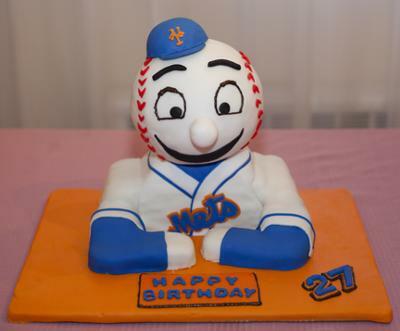 The "Mets" on the front of the cake is a double layer of fondant in order to get the 2-tone effect. All other decorations are fondant. The hat is a fondant/gum paste mixture. Mr. Birthday Cake - that's exactly what it looks like, I really loved it, looks awesome! Children must be really amazed too! This is the first time i'm seeing this cake here!!!!! I made this back in 2010 and I don't think it was me who posted the image here. My husband just happened to do a search for Mets sheet cake and the image came up and we couldn't believe it was here! Very creative and sooooooooooo cool!!!!!!!!!!! THAT IS A DARLING CAKE AND SUCH A CUTE IDEA.